Net Control 2 SmallClass. Cheap software for teaching in schools, k-12, libraries. 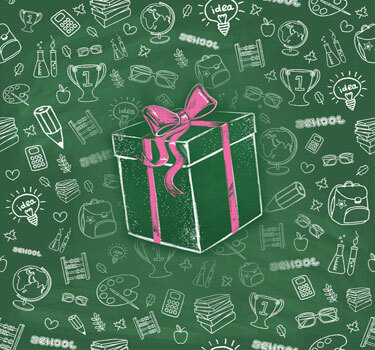 SmallClass edition was specially designed and adapted for small classrooms. Retains all functionality of Standard and PRO Editions except for groups and connections management, centralized deployment features; automatization of installation, view profiles and several other features that are uncommon for use in small labs. $199.00 only per classroom license! The lowest price in comparison with other editions, if you need to control from 7 to 20 students. The license is permanent (for the purchased version), does not require any recurring fees. Includes 12 months of free upgrade period to any future versions of the software. Optimized for small labs, simple in installation and configuration. Supports Microsoft Windows on teacher and student computers only. Supports Windows 10 in both 32- and 64-bit editions. Broadcast Teacher's desktop to one or several students at the same time, or a screen of one of students to others. Annotate on the screen in the process of screen sharing. 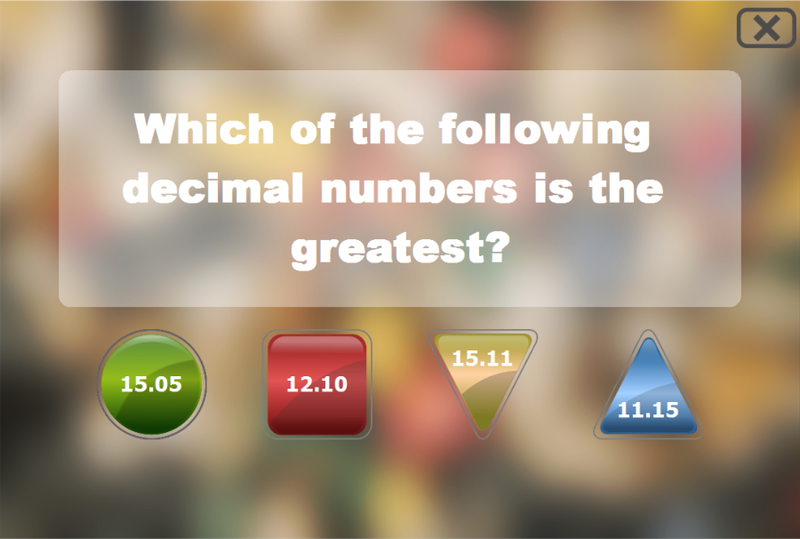 Make instant polls, create and run quizzes, in a few clicks send work to students and collect files back to the teacher computer; use Desktop Recorder tool to prepare tutorials for students; use Co-Play feature to share multimedia content with them. Monitor student activity in realtime, work with students remotely sharing their screen and controlling it in a cooperative mode, remove distractions with web and application monitoring tools. Use wide range of communication features: send text messages, screenshots, chat with one or several students, speak to them; receive help requests from students. Prevent access to undesirable web-sites and applications, apply restrictions to print and USB devices; shutdown and wake up computers remotely; manage files and programs. Use built-in Planner tool to create lesson plans, keep all lesson events in journals, use flexible and powerful grading tools. For more detailed information about these and many other features, please click the button below. 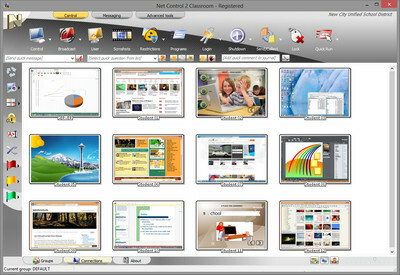 Net Control 2 SmallClass was specially optimized for small classrooms. 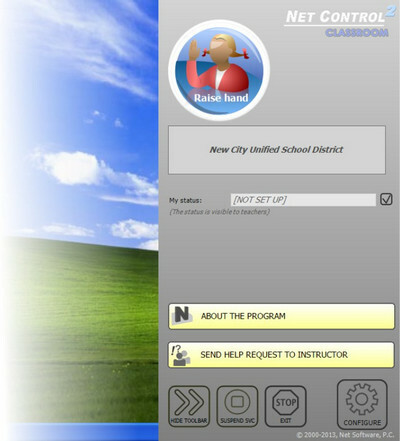 Each classroom license may be used on one teacher and up to twenty student computers. Licenses are not expandable, and if you need to control more than 20 students or work with several classrooms, please consider Net Control 2 Classroom or PRO Edition. Net Control 2 does not require a domain or network server. It can work in big or small networks, wired or wireless, it is possible to have multiple classrooms with different Net Control 2 SmallClass licenses in the same network, if each classroom is licensed with its own license. Includes more than 150 teaching, controlling and monitoring features. For more information please click here. 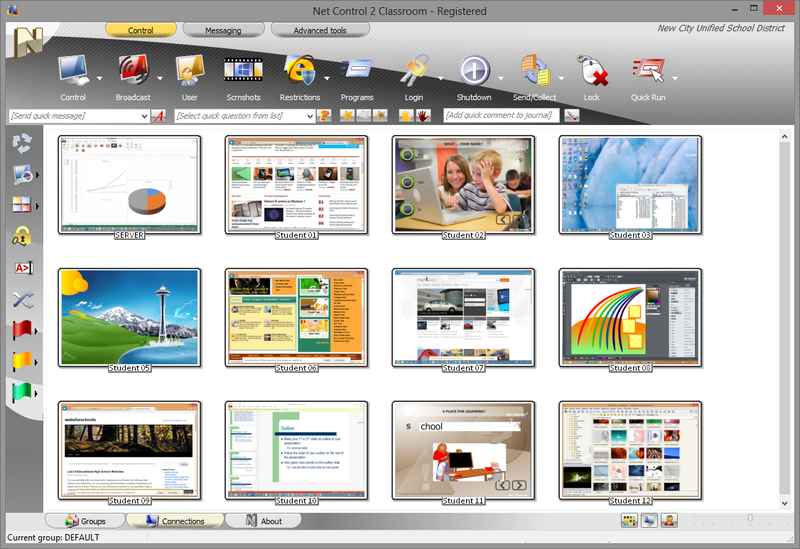 Net Control 2 SmallClass supports all modern versions of Microsoft Windows, including Windows 10, both 32- and 64-bit editions, as also Windows 7 and XP. This edition does not support and is not available for other platforms than Microsoft Windows. We are proud to offer Net Control 2 SmallClass Edition classroom license for $199.00 only (without VAT or Sales tax). SmallClass licenses are perpetual and include 12- month free upgrade and maintenance period. Microsoft Windows 10, 8, 7 Service Pack 1, Vista, XP Service Pack 3. 64- or 32-bit editions; or Windows Server 2012, 2008R2, 2003R2. 0.005-0.2 MBit/s per client: low-traffic operations - 0.01 MBit/s; direct full-screen control with keyboard and mouse - 0.2 MBit/s; broadcast teacher's screen to students - 0.15 MBit/s either for all recipients (Multicast is supported) or per client. x86- or x86-64-compatible CPU, Intel Atom 1.2 GHz and higher. Windows 7, 8, 10 32-bit: 1GB; Windows 7, 8, 10 64 Bit: 2GB. Server operating systems: 4GB. Not expandable: you cannot purchase additional teacher or student licenses to use the software on more than 1 Instructor or 20 Student computers. Free Demo versions are available by request. Educational and commercial organizations may request us for a fully-functional 30- or 45-day free evaluation license. For your request we will open a ticket in our online helpdesk. To read our replies or if you just need to add something, please log in to the online helpdesk here: http://ask.netcontrol2.com. A copy of all our replies will be also sent to your email address.